free rules & Scenario on the DWMG Website. I had the Scenario map but I was hoping to get more then one game out of the sewer and started with the a new map the table is 1200mm*1200mm so I made the table in 4 tiles 600mm*600mm so that I can make up new tiles when I need them. All tunnel entrances & exits are 150mm to the middle of the tunnel so that they can be put together to make up new Scenario maps below is the plan that I was working to it was as close as I could get to the Scenario map from DWMG . 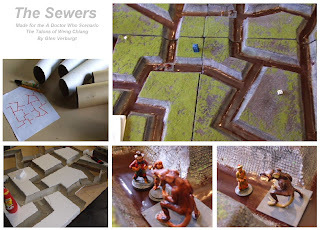 All you will need to make the sewers is a lot of paper rolls & some thing to fill up gaps I had a lot of Polystyrene but you could to it with paper. I just cut the paper rolls in two dowe the midlle and layed them out on the 4 tiles as per the map. Filling all of the gaps in the Sewer & add some stone work to the walls of the sewer the stone work was made by stamping the filler when it was still wet . Stated painting the sewer walls with a mid gray then drybrush it with a light gray when it was all dry I painted it with a black / blown wash it was 70% water and 30% paint. At the end of day 5 I had the bright idea to paint both sides of the tiles so I painted up the other to look like an old streets the final step was to the flock all of the tiles and have a game .